First hubby and I rally the troops. Now that the kids are 16 and 18, I seriously thought that they were going to mutiny this year and refuse to join us, but they complied (we bribed them by saying we’d take them out to lunch first) and so all 4 of us, plus Tucker the dog, piled into the car and away we went to our favorite “Cut Your Own” tree farm. 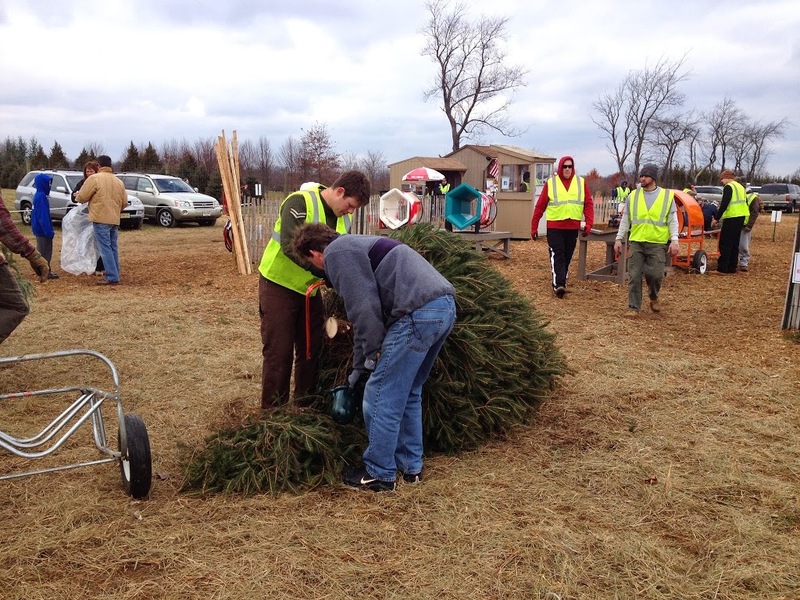 When we arrived, my son purposefully got out of the car saying, “OK, this year we are going to be extremely efficient,” and headed over to get the saw and tree cart before heading on over to the bank of trees. 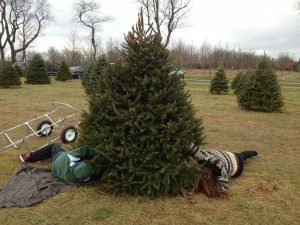 Just to clarify, usually this Christmas tree process involves a LOT of tree looking, assessing, hemming and hawing by all of us but mostly by my husband, who takes a laboriously long time to make ANY decision and in particular looks at hundreds of trees each year before he decides we’ve found just the absolutely perfect tree. 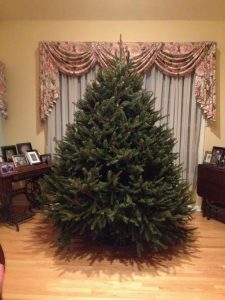 It can take us a full hour of just looking for the right tree because of my husbands very high Christmas tree standards. 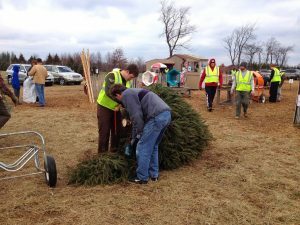 And remember that once the perfect tree is chosen, it then has to be cut down which can take another 20 minutes or so, depending on the trunk of the tree. AND IT WAS REALLY, REALLY COLD AND WINDY OUT THERE TODAY. Hence my sons wish to be efficient. Because, since they’re teenagers neither of them wore gloves or hats. And in case you think I’m a bad mother because I didn’t bring gloves and hats for the kids with me, let me assure you that at this age, there isn’t a single thing I can say that would encourage them to wear gloves, hats or often even coats. THEY KNOW EVERYTHING, THEY ARE TEENAGERS! Lo and behold (I know, I thought I’d go all religious on you it being the Christmas season and all), the very first tree we saw as we started walking towards the bank of trees was the one above. A perfectly round, fat, full 7 foot fir, standing all alone in the middle of the field with no other trees within 20 feet. My son and daughter immediately said that this was The Tree, and I had to admit that it was really perfect; all fat and round and just the right height and a Frasier fir which is my favorite kind. But would it pass the muster of the infamous husband? Amazingly enough, he came over and after walking around it for a bit, agreed that it was indeed the perfect tree and so the kids got right to cutting that sucker down. Now what makes today so extra special for me, is that 3 years ago I had just recently had my mastectomy surgery and had also just started taking Tamoxifen which had put me into a very depressed mood for the first 6 weeks, and so I wandered around the day of our 2010 Christmas tree cutting ritual in a Vicodin induced haze with little energy and even less Christmas cheer. Today was such a vindication for me to be at the exact same spot 3 years later, feeling so good, so happy and so content. Another little victory. 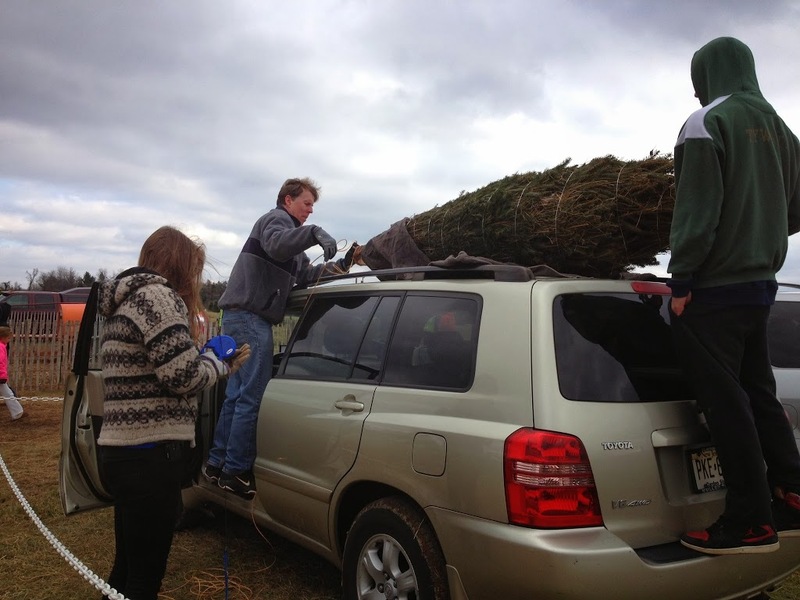 The kids cut that baby down in no time flat, we had it bound up, the obligatory styrofoam cups of hot chocolate were had by all, Tucker ran around and begged for attention from everyone there and before we knew it the tree was tied to the top of the car and we were on our way home. Did I mention that it was really, really cold out there today? And now for the next part of the Christmas tree ritual which entails getting the tree acclimated to its new surroundings. We keep her well watered so that she can get all settled in and then later on (maybe tomorrow if we’re all ambitious enough) we’ll get the lights up and then put the ornaments on. For me, now that the tree is in the house, the season is really here. Happy, happy, joy, joy. We got our tree up yesterday too, but all we had to do was buy it from a charity that sells them every year. Your way looks a lot of fun though (even if cold.) Good to see that your health is doing well. My mother is a breast cancer survivor – she had it 26 years ago, but I still think it must be a frightening experience and not surprised that you felt depressed at first. Claudia, this was deeply moving. I am so glad that you’re feeling so much better! Thanks for sharing this with the Creative Buzz Hop, and this Christmas, have the best state of health ever. What a difference 3 years can make, right Claudia? Thank you for linking up and sharing your story Claudia. I’m so happy that this year you were able to be totally tuned in for your tree experience. It sounds like you picked a lovely one. Welcome to the Creative Buzz Hop, you did it perfectly! Thanks for the lovely note, Tamara! Enjoy your holidays!